Myrtle is a woman about 45-50 (she never reveals her actual age, which is a manifestation of one of her deeply lying problems – the difficulty of accepting the advance of aging). She has no one (no husband, no lover, no children) but her art and her reputation as a major film and stage star. Grappling with issues such as growing old and loneliness (you know about lonely nights? how about those lonely days? ), she is good friends with alcohol, but not so good friends with the writer of her new play, “Second Woman”. Uncharacteristically, Myrtle can’t find a thing to identify with in the new text she is working on. The struggle to create a believable character is exacerbated by the death of a young female fan – a 17-year old who dies seconds after meeting Myrtle outside a theatre. The image of the rain-soaked, crying, almost collapsing in her emotions young woman haunts Myrtle into a mental state that crumbles further as the film progresses. Who is this young girl? Or, rather, what is she to Myrtle? Searching for the answer of this devastating question, Myrtle resorts to visiting the girl’s funeral, then a spiritualist, to letting go of herself on stage and improvising with abandon, even viciousness, before actual audiences. No one who has ever been to a theatre performance can help but feel uneasy while watching these sequences. 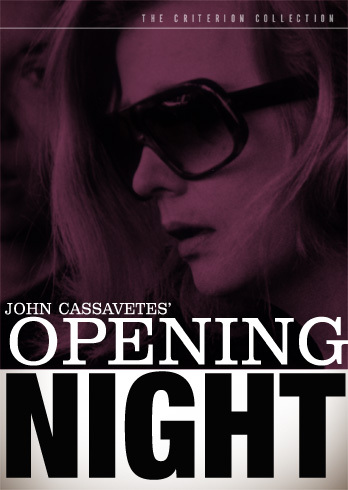 In this sense, Opening Night is a quite visceral experience. I found it extremely interesting that Myrtle had no one to turn to outside of the theatrical world. She could only look for help from the director (Cassavetes fave Ben Gazzara), the producer, even the writer, to whose face she openly admits, “I don’t think we could ever be friends.” All these people however, despite harbouring some kind of love, or at least respect, for Myrtle, are after their own agendas – keeping up reputations, ensuring the success of the play, maintaining political or artistic control. Myrtle is basically on her own, fighting demons, wrestling with solitude, trying to preserve the last shreds of her integrity. All leads up to the final scene – the New York premiere of the play, the actual opening night. I don’t want to spoil it for you (if this is relevant at all in a Cassavetes movie), but I should say what happens is the living nightmare for any theatre director. The interaction between Myrtle and Maurice (played with verve by Cassavetes himself) in that closing scene is electrifying. So human, so wonderfully weird, so worthy of being captured on film. The end is only natural, as Myrtle fights with her last ounces of strength to do probably the one thing she can – get out on that stage and give everything she has, and to hell with it. We as an audience can only applaud this reincarnation of life.